We have gone from a vertical society to a horizontal society where everybody has an opinion about every decision you make, everybody has an opinion on the Internet straight away. Basically the respect for people who make decisions is gone because every decision is questioned. So one of the most important qualities of a good leader now is massive resistance to stress. Under stress you become smaller and smaller until you cannot give out a message any more and that, of course, is something that is vital. Many people underestimate this challenge. Wenger instantly puts his finger on why being a leader in the 21st century is so much more difficult than it used to be. We invite feedback from all quarters. We’re asked to be open. Everyone should be allowed their say. Respect – which is always a tough thing to achieve at the best of times – has gone out of the window for all but the select few. The science behind resilience and the importance of it is slowly becoming more widely recognised and – if Wenger’s experience is anything to go by – needs to be placed higher up the list of qualities for leaders to develop. Winners: And How They Succeed is definitely worth a read: a genuinely fascinating insight into people at the top of their game. I was sad to read that Seve Ballesteros lost his fight against a brain tumour yesterday. It inevitably made me think about my own dad’s battle against a similar type of tumour that he lost 2 and a half years ago. Has Sven Goran-Eriksson learned anything? Another World Cup, another appearance as a manager by Sven-Goran Eriksson. However, whereas he was England manager in 2002 and 2006, at the South African festival of football that is World Cup 2010, he finds himself coaching Ivory Coast. And, the fickle finger of fate contrived to put him against some of his old adversaries. Drawn in the Group of Death, Ivory Coast have had to play both Portugal and Brazil and, despite being Africa’s top-ranked country at this World Cup, they only managed 1 goal and a solitary point. Now, admittedly, Portugal and Brazil represent two of the toughest sides in the competition, but Sven does have some history here. Cast your mind back to 2002. Remember who put England out of that tournament at the quarter final stage? Yup, none other than Brazil, with David Seaman famously getting caught out by Ronaldinho’s outrageous 40-yarder. And who, pray, put England out of the 2006 World Cup? Could it have been Portugal? So it was. In fact, Portugal also dumped England out of Euro 2004, too, so Sven knows a bit about the Iberian country and style of playing. OK, so Sven’s in charge of a different country, but you can’t help thinking he must have learned something from his previous encounters, can’t you? Seems not. Ivory Coast now face North Korea in their last match with the likelihood that they’re playing purely for the wooden spoon. 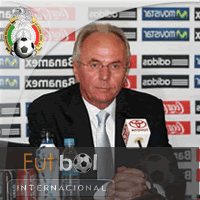 Author robPosted on June 21, 2010 Categories sportLeave a comment on Has Sven Goran-Eriksson learned anything?